A rust-ridden knife can be frustrating for completing work around the house, but in the field it can be life threatening. Featuring the latest in metallurgy innovations, the new Pacific Salt Black FRN Folding Knife is a powerful, rustproof knife that can be taken to the depths of the ocean and back. The secret to its unfathomable power is its H-1 steel-forged blade. The steel is precipitation-hardened and utilizes a higher nitrogen content to reach a completely corrosion-resistant Rockwell hardness of 57-58rc. As if that was not enough, the engineers at Spyderco have housed the blade in a durable FRN handle for ultimate toughness. The ruggedized handle utilizes a textured exterior to disperse moisture for an unbreakable grip that holds up in wet or icy conditions. 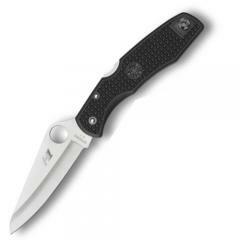 Spyderco's signature thumbhole opening cuts into the blade's face and allows users to quickly flick the knife into action with either the left or right hand.